6 November 2012 Identity assurance – shall we vote on it? ... and a few other people may have seen Rt Hon Greg Clark MP's press release yesterday, Register to vote: new online service launched. IER will prevent fraud by enabling government to check that everyone on the register is who they say they are. This will lead to greater trust in the legitimacy and fairness of elections. "Prevent fraud"? That's a tall order. The nine million numbers were issued by the Department for Work and Pensions (DWP) and are registered on its database, but officials do not know if they are held legitimately. "This will lead to greater trust"? Mr Clark may prove to be right. Or wrong. From 10 June 2014, people will be able to register online in just 3 minutes by providing their name, address, date of birth and National Insurance number. ... and DMossEsq took the new on-line registration service out for a spin, pausing only to note that he must be about to provide not only his name, address, etc ... but also, unmentioned by Mr Clark, his IP address, his broadband provider and his location. Let's start at the end of the process. The last thing you discover is that you haven't registered at all. Hardly surprising, of course, given that GDS is not an Electoral Registration Officer (ERO). All GDS do is send the data you've just entered to your local authority, who will either register you or question you if there seems to be something amiss. You need to provide additional information to the Electoral Registration Officer in order to be registered under IER. "Receive a letter"? Five individuals in the family. So five letters. And there was dear old Mr Clark telling us that "putting public services online is saving taxpayers money". Once again he may prove to be right. Or wrong. There's meant to be one electoral register per constituency. It looks remarkably as though GDS will now have a copy as well as the EROs. IER is #1 on GDS's list of 25 public services by digitising which they aim to "transform" government in an exemplary fashion. And they say the service will be used by 46 million people. That's quite some transformation. It means that Francis "JFDI" Maude, who promised not to create a national identity register, will in the event have created ... a national identity register. And where is this national electoral register? In the cloud. Possibly with Skyscape. Or Carrenza. Or Akamai. One way and another, not under GDS's control. Nor your local ERO's control. Anyone could be helping themselves to the electoral roll in the cloud. In addition, in order to complete the registration application process, DMossEsq had to give permission for his data to be shared with "other government departments". The new online tool is part of the move to Individual Electoral Registration (IER), replacing the old and outdated household registration system with individual registration. Now that we've stopped being outdated, we can swap telephone numbers and email addresses. If you try to Continue without ticking any of the boxes, GDS get all shirty and start talking to you in red, see opposite. Most voters will no doubt sensibly choose the Post option. DMossEsq tested to see if there's anything to stop you applying twice. There isn't. GDS aren't validating carefully enough. Will DMossEsq be given two votes in the next election? Probably not. But his local ERO may be a bit irritated that GDS send the same data twice. Will DMossEsq appear twice on Mr Maude's new national identity register? Again, Mr Clark didn't make that clear. IER underpins the democratic process in this country and is secure and robust. Mostly, you'd expect dashboards to be updated automatically. They obviously do things differently at GDS. How long before we see "Situations vacant: agile dashboard assurance director, central London, 2 days a year"? The Halarose company sells electoral registration systems to about 80 local authorities in the UK. We have come across them before, when it transpired that they keep the electoral rolls for these local authorities in the cloud, with Amazon Web Services, in the Republic of Ireland. According to them, "the data doesn't persist at GDS" – having sent the details of an individual applying to vote to that individual's local ERO the idea is, according to Halarose, that GDS then delete those details, they don't "persist". How do Halarose know? How would you know? GDS certainly don't say that anywhere in the application dialogue – DMossEsq has been through and applied for a third time just to check and, no, the wording hasn't been changed since yesterday. On the other hand, they do say that they may want to contact applicants, which is why they ask for an email address or a phone number. If Halarose are right then, no, GDS haven't set about creating a national identity register even though the design of the application dialogue makes it look as though they have. Perhaps GDS will for once do its parishioners the honour of explaining themselves. The level of confusion GDS have sown with their IER publicity is impressive. 18f is the would-be US equivalent of GDS. Alex Howard is a journalist on several influential journals. And the British public is the British public. Anyone taken in by this claim that you can now register to vote on-line in the UK is going to feel legitimately aggrieved when the truth comes out, especially the Electoral Commission whose job it really is to register electors, and not GDS's, who might do well to dispel the current confusion quickly. GDS might try clearing up another confusion at the same time. Public Servant of the Year ex-Guardian man Mike Bracken CBE works for the Cabinet Office and is sometimes described on that basis, in the US press at least, as a member of the Cabinet. Confusing. But he's not. Official forms in the UK are normally available in both English and Welsh. That includes applications to register to vote. There's an English application form and there's a Welsh one. These are both hard copy forms available from GDS's apply-to-register-by-post page. As we have seen, there is an English form available on-line. That's where the examples above come from. Why isn't there a Welsh one? 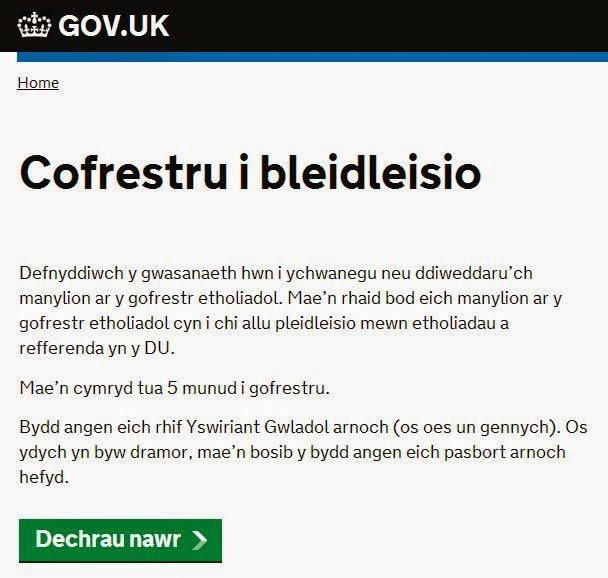 The answer is that there is a Welsh language application form on-line – https://www.gov.uk/cofrestru-i-bleidleisio. It's a funny mixture of English and Welsh but it's there, it exists, and yet GDS haven't told anyone about it. Why? It seems like a bizarre omission. GDS have produced the form but don't tell anyone. Why don't they offer the chance to proceed in Welsh early on in the dialogue? When you submit your completed application form, the details are forwarded to the appropriate electoral registration officer (ERO). Some of them will be complete, accurate and legitimate. Some will have honest mistakes. Some will be attempts at fraud. And some will be submitted by trolls simply because they can. In principle, a computer program could be used to submit hundreds of millions of applications automatically. Should GDS perhaps introduce a captcha facility to stop EROs from being deluged? It's up to the EROs to decide whether to register any given applicant to vote. It's not up to GDS. At the moment, any date of birth will be accepted so long as that makes the applicant less than 115 years old. And any address can be entered. Some letters in the National Insurance number (NINO) are acceptable, some aren't, and any numbers will be accepted. The GDS facility validates the NINO a bit, but it doesn't check that it is the applicant's NINO and it doesn't check that the NINO actually exists. Before 10 June 2014, there was just one application form per household. It had to be signed – there is no equivalent in the new GDS application system – and once posted back to the ERO, any fraudster or troll had run out of ammunition to work with, whereas now there seems to be no limit to the number of applications that can be submitted. There could be legal reasons for those deficiencies. There might be. There might not be. Either way, EROs could find themselves with a lot of work to do as a result. We could digitally sign our applications. and ... NINO, and so on. IDA will rely if it ever comes into being on a number of so-called "identity providers" (IDPs) and the apparent benefits above could be achieved by getting our putative IDP(s) to confirm with the EROs that the details given are authentic. In that scenario, the individual trying to register has become redundant. Registration can be achieved simply by communication between the EROs and the IDPs. The individual cancels out of the equation. Either this new facility of GDS's remains unhelpful or it becomes so helpful that we're no longer needed. The first day that individual electoral registration came into force, 10 June 2014, there was already an entrepreneurial website offering to submit your application to register to vote for you, for only £29.95 – just one of the many ways in which digital-by-default can help to boost the economy. It may feel like a new world now that we have on-line application to register to vote in the UK but some traditions carry on, at least for the moment, Electoral Registration Officers must all conduct house-to-house canvassing during transition to new electoral registration system. One small point on your first paragraph: you don't get onto the electoral roll within minutes: what's happened is that you've applied to go onto the register. Your local authority then completes the process. Good to see that point first raised on this blog confirmed by the man in charge. Your point about law being at the service of users (citizens) is really, really important. Statutes that make sense to parliamentarians and officials, but don't work, are useless. As St Paul the lawmaker might have said: If I speak with the tongue of men and angels but have not useability, I am as a sounding brass or a tinkling cymbal. Mr Heaton has a special interest in drafting the law. St Paul didn't. Far from being a "lawmaker", St Paul's expertise was in mohair, specifically for use in making tents. And far from usability, pace Mr Heaton, it's charity that St Paul promoted, please see opposite. "Charity vaunteth not itself, is not puffed up ...", unlike the brass-tongued claim "I fought the law and the users won", which sounds like a tinkling cymbal vaunting itself and puffing itself up. What, you may ask yourself, lies behind this claim? You're not alone. Several people would like to know, e.g. the redoubtable Paul Clarke, and Edward Crocker: "What were the laws you got changed and what was the timescale for this?". Good question. An example of a legislative change we worked with the policy and legal team on, was to remove the requirement for online anonymous voter registration (people who have concerns for their safety) to be available on June 10th. This is a complex area that needs a lot more user research and has additional information and offline documentary requirements (physical copies of court orders etc). We felt that by including this option in the online service, we risked making it harder and more complex for anonymous registrants as well as exposing the vast majority of people using the service to a concept that has no relevance to them at all. We would rather create the time to research this area fully and come up with a new service for these people. We went through the process of proposing this change, discussing and debating with the policy and legal team, preparing evidence for statutory instrument (SI) debates in parliament, and the debates themselves – all over a 3 week period. It's worth noting that booking SI debates has a long lead time, however, importantly it can be possible to add additional items into scheduled debates, which is what we did. It looks from that response as though the Electoral Registration and Administration Act 2013 demanded something impossible – anonymous applicants can't show hard copy court orders on-line. A "useless statute", as Mr Heaton calls it. Since it's impossible, GDS can't do it. But if they didn't do it by 10 June 2014, GDS would be breaking the law. So they argued their case and the law was changed. Nothing heroic about that, it's not obvious that "the users won" and it's not obvious that there was any fight. So why the triumphant note in the tinkling brass cymbal? We can only see the answer through a glass, darkly. It should be noted that there is a technology available that should, in theory, be able to solve the problem of anonymous applicants. As things stand, they can't show their court orders on-line because the court orders are hard copy, material objects. But court orders could be issued as digital certificates, dematerialised court orders instead of material ones, if only GDS had got to grips with PKI, the public key infrastructure. You might expect them to have got to grips with this technology by now. Their lasting power of attorney exemplar #25 (LPA) has been knocking around for ages and could approach the 21st century if the LPA was issued as a digital certificate. But it isn't. Here they are again, with electoral registration exemplar #1, ducking PKI. That's why they had to ask to be let off doing anonymous applications to register. PKI is one of the technologies needed to get identity assurance working (IDA). No PKI, no IDA. No IDA, no anonymous applications to register on-line. GDS fought IDA and the users lost? "I fought the law and the users won", you say. Judging by your answer to Edward Crocker, there was no fighting involved. Instead, a new statutory instrument was made. Not unprecedented, these have been running at the rate of about 3,000 a year since 2010. The question remains in what way the users have won. Rt Hon Greg Clarke MP says in his press release that "IER will prevent fraud by enabling government to check that everyone on the register is who they say they are. This will lead to greater trust in the legitimacy and fairness of elections". As the Product Manager, can you please explain how IER prevents electoral fraud any more effectively than the previous household registration procedure. And having recourse to National Insurance numbers for IER is likely to lead to the same problem they have in the US with social security numbers: "Identity theft is one of the fastest growing crimes in America. A dishonest person who has your Social Security number can use it to get other personal information about you. Identity thieves can use your number and your good credit to apply for more credit in your name". So says the US Social Security Administration. Can you please explain how IER checks that applicants are who they say they are any more effectively than household registration did. Lastly in connection with the Minister's promises, can you please explain how you will measure "trust in the legitimacy and fairness of elections" to determine whether it is greater with IER than without it. It looks as though GDS will be collecting IER applicants' details all in one place, the database behind the on-line application form. The Electoral Registration and Administration Act 2013 makes it illegal to create a consolidated electoral roll. Is there a danger that the IER application service is breaking both the law and Rt Hon Francis Maude's promise not to create a centralised population register? Identity assurance (IDA) is meant to prove that a person is who he or she says they are. GDS couldn't get IDA working in time for IER. So how do electoral registration officers know that an applicant is authentic? As far as we know, they are reduced to name, address, date of birth and National Insurance number. It's not just IER. GDS couldn't get IDA working in time for Universal Credit, either. And it wasn't ready for last year's on-line PAYE tax code trials. Nor was IDA ready for DVLA's view your driving record service. We are aiming to launch our private beta of the identity assurance option this week. This will mean that a limited number of users will be given the opportunity to trial identity assurance as an alternative to the existing log in process. There you have it – "... this authentication process ... does not provide us with the level of confidence the user is who they say they are ...". No good for DVLA, but it's supposed to be good enough for applications to register to vote. Thank you for your 27 June response. Rt Hon Francis Maude MP, Cabinet Office Minister, is famous for referring to laws he doesn’t like as "myths" that need to be "busted". And for his claim that "we’re the JFDI school of government". Also for embracing Martha-now-Lady Lane Fox's call for "revolution, not evolution". Working in his department as you do, it must be hard to resist this heady demagoguery. Thus, presumably, your otherwise inexplicably triumphalist "… it's early days for the register to vote service, but with currently the highest satisfaction rating of any online government service, it's testament that those battles were worth having … This is what doing the hard work to make it simple for users is all about … *drops mic*". As you should all know, when contempt for the law reaches a sufficient hysteria to prompt a revolution, it's the innocent people/users who suffer in the new world from the resulting Terror. From that point of view it is a pleasure to see that your achievements with IER actually required no fighting ("I fought the law"?) but simply rational negotiation and the observance of due process provided for by a wise Constitution. Far from being "slightly off topic", as you put it, "trust in the legitimacy and fairness of elections" is central to IER. 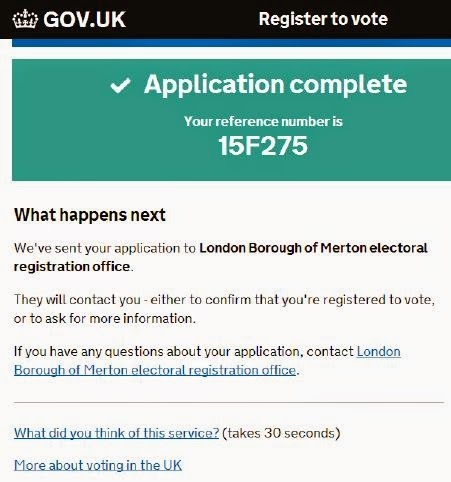 When a user gets to the end of the on-line application process, he or she sees: "What happens next … We've sent your application to the [local authority] electoral registration office". In that case "we" is GDS. 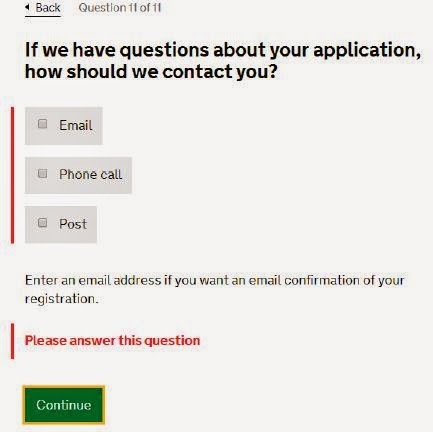 Question 11 of 11 in the application process asks "If we have questions about your application, how should we contact you?". The implication is once again that "we" denotes GDS. If GDS intend to contact applicants, then GDS must be keeping the applicants' details. Illegally. But you say they're not – "this isn't the case". If GDS insist on fomenting a belief that the law is a collection of myths that need to be busted by callow revolutionaries who JFDI because they madly believe that they know what's best for users, then they undermine their own credibility. GDS are going to find it difficult to make people believe that the law isn't being flouted and that the applicants' details aren't preserved centrally. You say that IER has "currently the highest satisfaction rating of any online government service" but you make no reference in your 27 June response to the question how "IER checks that applicants are who they say they are". IER uses the same technique as DVLA's view-driving-record service, a technique which relies on National Insurance numbers (NINOs). Far from being highly satisfied, DVLA say: "Whilst this authentication process is fairly quick and straightforward, there are some downsides … it does not provide us with the level of confidence the user is who they say they are in order to offer them more information such as their photo image or allow them to link to a transactional service". The Electoral Commission are due to launch an IER public information campaign next month. If DVLA don't think NINOs are good enough to link drivers to a transactional service, then it would be irresponsible for the Commission to say that NINOs are good enough to link people to a vote. Someone has been filling the Electoral Commission's head full of unjustified confidence in eVoting. It's been tried and failed to work in Washington DC, Estonia and Norway. Under the Lane Fox dispensation, GDS are in charge of digital government, and it is GDS's responsibility therefore to rein in the Commission, who are getting way ahead of the game, recommending eVoting when we can't even do eRegistration. Among others, your responsibility, Mr Herlihy. "Why don't they offer the chance to proceed in Welsh early on in the dialogue? ", asked DMossEsq 10 days ago. After dealing with people who wish to register by post – which remains an option – and after seeing off the illegal residents. Yesterday, GDS published the list of the public services that will be first to use IDA, or "GOV.UK Verify" as it's now known, please see The next 6 months: services that plan to start using GOV.UK Verify. GDS's application service to register to vote is not on the list. Never mind the upcoming general election, the service will have to continue to limp along with no on-line identity assurance. Viewing your driving record will be graced with identity assurance, if GDS are to be believed, but not applying to register to vote. In time other forms of verification may become available which means that a person may not be required to produce their NINO [National Insurance number] and DOB [date of birth] when making a new application to register – the legislation has been drafted with this in mind. On 18 May 2011 the Government announced plans for the development of a consistent, customer-centric approach to digital identity assurance [emphasis added] across all public services. The intention is to create a market of certified identity assurance services delivered by a range of private sector and mutualised suppliers so that people will be able to use the service of their choice to prove their identity when accessing any public service. The draft legislation will allow digital identity assurance to be used in future to verify an application to be added to the electoral register. Additionally it may be possible for verification to take place at local authority level using similar local arrangements. We will monitor these developments with a view to improving the verification process if it helps to simplify the system and encourages more people to register. Apart from the problems above, how is individual electoral registration going? Labour said 307 of 373 local authorities that provided data had recorded a reduction in their electoral roll. Overall, there had been a reduction of 950,845, the party said. "I fought the law and the users won"? Our nation has a proud heritage as the mother of Parliaments, yet the worrying and covert spread of electoral fraud threatens that reputation. While all politicians want high turnouts, we cannot sacrifice integrity and confidence in our democracy through misplaced political correctness or woolly concerns over “political engagement”. It is time to awake from our state of denial and take action against the electoral crooks who threaten our elections. British democracy should not be reduced to the level of a phone vote in an X Factor contest: “vote early, vote often” is the problem, not the solution. 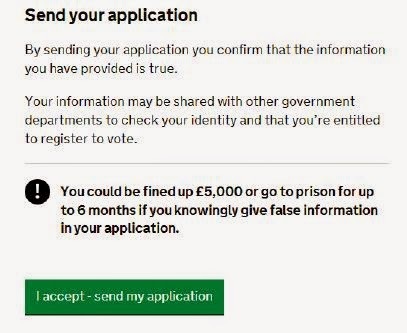 Now that we have individual electoral registration in the UK and now that we have GDS's on-line system for batching up applications to register to vote, everything is different. The transformation isn't quite complete. There's only one letter – for the household – rather than one per voter and the ERO's reference is still "Household Information Letter". When will the ERO send emails instead of letters? When will the "Current Voting Method" column include "Electronic" in addition to "Polling Station" and "Postal"? We don't know the answers. But there is another question. As we speak, the Office for National Statistics is preparing for the 2021 census, see for example Come along to an Office for National Statistics supplier briefing to find out how you can get involved in the delivery of the 2021 Census. Many people expect the next UK census to be conducted electronically. How likely is that to be the case? How likely are we to have an electronic census in five years time? Given the limitations of the electronic registration of voters? And the repeated failures of the assisted digital project to make any progress? And the sad death of the national identity assurance scheme, GOV.UK Verify (RIP)? Not very. 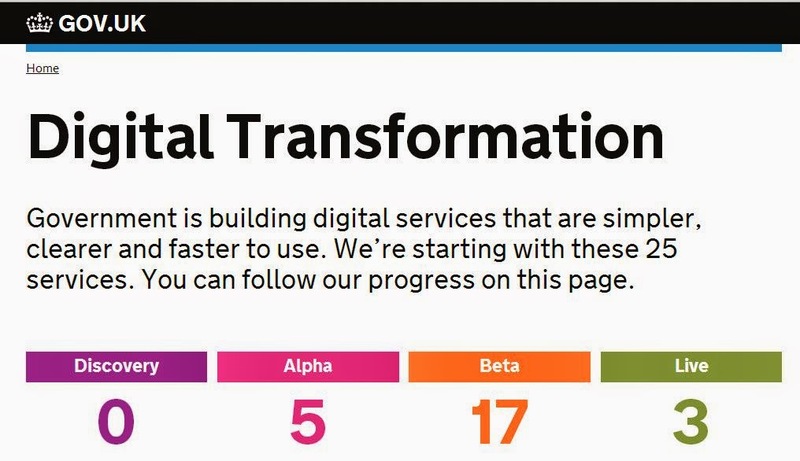 All that alleged transformation GDS are so proud of – lipstick on a pig? That's what the departed deputy director of GDS thinks. Last week a man you've never heard of said something. On 28 April 2016, Dr. Philip John Rycroft CB DPhil, Second Permanent Secretary at the Cabinet Office and Head of its UK Governance Group, published Modernising voter registration - the unsung story. 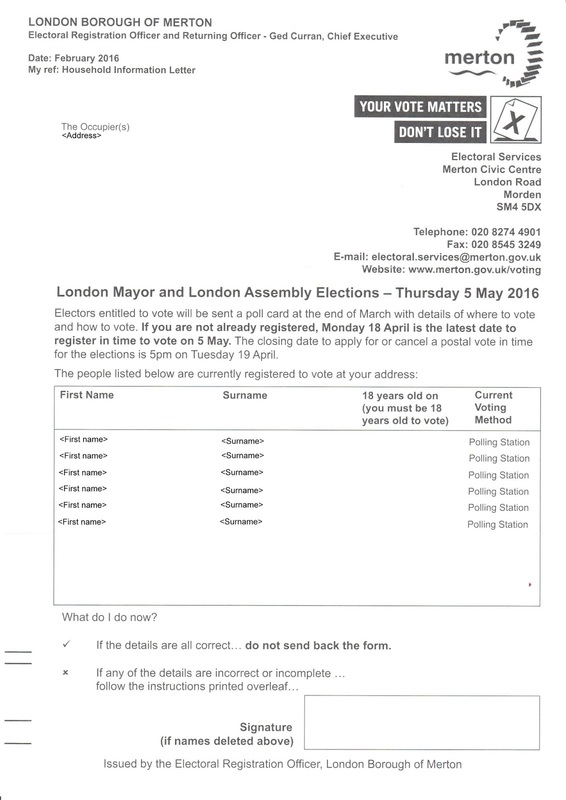 He wants people to be sure and vote in this week's local elections, police commissioner elections, the London mayoral election and the June EU referendum. Fair enough. That's his job. It's a moot point whether GDS's batch application system for registration counts as modernisation. As for "unsung", 5,760 words above says GDS's efforts are anything but. Second Permanent Secretaries asking for praise when their staff just do their job? Remember the Biblical warning of the previous permanent secretary, Richard Heaton, not to be "as a sounding brass or a tinkling cymbal". The brass was being sounded again yesterday and the cymbals were tinkling. GDS's batch apply-to-register-to-vote system recorded some monumental activity in the run-up to the UK's 8 June 2017 general election – well over 600,000 applications were made on 22 May 2017 alone. Those applications are collected by GDS's system and forwarded to the appropriate EROs, the electoral registration officers for each area. Registration is up to the EROs, not GDS. Many applications will be legitimate and correct, some will be fraudulent, some will contain errors and many will be duplicates. They all have to be checked manually before the electoral rolls in each area can be updated. You might assume that GDS's GOV.UK Notify would be pressed into service here but, no, applicants are not told the result electronically. Have they been registered or haven't they? They don't know until a polling card arrives by post or until they try to vote in person. And who is that person? You might hope that GDS's GOV.UK Verify (RIP) would be pressed into service here but, no, it isn't, and the attempts made at identity assurance are puny and not worthy of the name. Even if GOV.UK Verify (RIP) were pressed into service, you can't assume that it would help. The long line of people unimpressed with it has recently been joined by the UK's Law Commission, who say: "Verify does not currently ensure that the person entering the information is in fact the person he or she is purporting to be; rather it focuses on verifying that the person exists" (para.6.67). GDS claim to be in the business of re-engineering public administration systems from end to end. They're not. In the case of individual electoral registration they have added a batch application system and left all the old manual practices in place. Questions have been asked about this for three years, please see above. There were no answers three years ago and there were no answers yesterday, please see alongside. And nothing in between. Transformation, which is what is needed and promised, is beyond them. "I don't think the "users" won. They are certainly not "users" in the normal sense of the word – more like "subjects" as they are compelled to comply, whether they want to or not. And they are now compelled to tell their local council their date of birth and NI number !!? Just so they can take part in a vote with the "none of the above option" not allowed. I don't think you gov clones understand that the only vote a lot of us want is on whether to hang the lot of you or to shoot you, or possibly both." Anyone know if there is a way of not providing NI number & dob - or max penalty for refusing? "Should GDS perhaps introduce a captcha facility to stop EROs from being deluged?" Captchas are in general a bad idea. GDS should implement a tarpit (if they haven't already - you can't tell without triggering it), which is any case is more effective than a captcha in this case. But this is a very minor point.